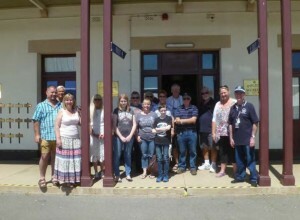 About 15 of us met at the Adelaide Gaol at 10am for a self-guided tour through the gaol’s historic buildings and grounds. The former gaol, which was built in 1841 and remained operational until 1988, housed around 300,000 prisoners throughout this time and it was interesting to learn about lives of some of the early prisoners and what they had done to be locked up. Women prisoners were held here from 1849 to 1969, when they were transferred to the Women’s’ Rehabilitation Centre in Northfield. 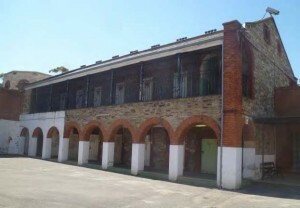 The remains of prisoners executed at the old gaol, were not allowed to leave the grounds or able to be claimed by family. The only female prisoner executed was Elizabeth Woolcock, who was hung using portable gallows on 30 December 1873, convicted of poisoning her husband. Her remains are one of around 30, that are buried “between the walls” of the gaol. 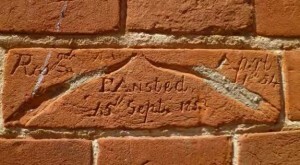 Prisoners working “between the walls” sometimes etched drawings, names, dates and symbols into the brickwork. Another interesting fact is that the two guard towers were never actually used as guard towers. One was used as a residence and supposedly inhabited by a guard and his family; the other was used for storage before being set up as a “hanging tower” between 1953 – 1964. A couple of our group seemed to know their way around the complex quite well…. say no more!! 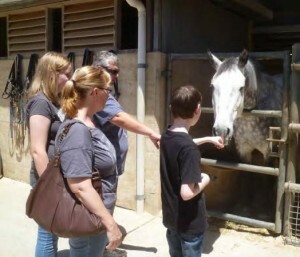 Police Historical Society, gave us a tour of the horse stables and facilities; we were lucky enough to meet a few of the police greys, too! The South Australian Police Force was formed on 28 April, 1838 with the appointment of 10 mounted and 10 foot constables. 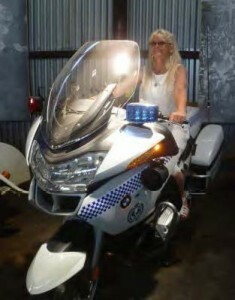 The museum is home to a large collection of vintage bicycles, motor bikes, cars and even a boat and Rose got to sit on a current model police bike (she’s crossed that off her bucket list!). The museum houses a huge collection of documents, artefacts, photos and other memorabilia in four wings of one of the old buildings and we got to browse amongst this huge collection, before finishing up around 2.30pm. Thanks to Stuart for organising this excursion and to Rose and John for their organisational skills! We had a great day. 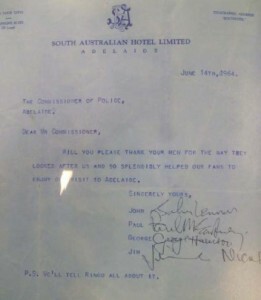 Memorabilia from the Police Museum: a copy of an original letter signed by The Beatles on their visit to Adelaide in 1964. It thanks the police force for looking after them during their stay. 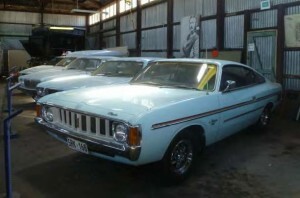 The original has been preserved and is safely stored away.